Lakewood Auto Bodyis a locally owned and operated automobile repair and paint shop started in Bonney Lake, WA in 1962. Our extensive services include auto body repair, mechanical repair, car and truck painting, and custom auto body painting. We specialize in car or truck painting GMC. The paint technicians with us are ASE and I-Car certified and hold a combined work experience of 27 years. Their superior professional skills and diligent approach ensure that the vehicles painted by them look as good as new. We also offer custom car painting Bonney Lake services. The region’s vehicle owners can get their vehicles painted in the color of their choice. Exceptional customer service is another of our hallmarks that makes us the best option for car or truck painting GMC in Bonney Lake, WA. The pleasure of driving is greatly enhanced when your vehicle is in a fine condition not only from the engine or mechanical point of view, but also from the outer appearance aspect. Many times, the paint of your GMC vehicle gets damaged and you wish to have it repaired and restored. Get car painting GMC only from an experienced professional having the right tools, technology and technicians to exactly match the original paint and shine. Bonney Lake, WA residents can come to Lakewood Auto Body. Our technicians are accomplished at all sorts of paint jobs on GMC vehicles, be it car painting GMC Envoy SLT or truck painting GMC Canyon. Car repairs including engine overhaul, suspension system repair, radiator fixing, etc. Why Lakewood Auto Body in Bonney Lake, WA? Look no further than Lakewood Auto Body for custom car painting GMC Yukon in Bonney Lake, WA. Our efficient services and great customer care will give you an unforgettable auto paint experience. Family owned repair and paint job. 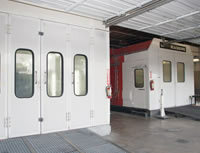 Single facility for comprehensive car care requirements. Lifetime warranty on all auto paint jobs. High-tech facility with computerized color matching systems.